Have you ever wondered how to pick out the best battery(s) for your solar panel system (or off-grid energy system)? Or have you wondered what makes one deep cycle battery better than another? If so, this article will answer these questions and give you specific things to check on before buying your new battery (to ensure you get the most bang for your buck)! Part 1) Quickly compare the three main types of solar batteries (lead acid, saltwater, and lithium). Part 2) Compare the components of batteries, such as: depth of discharge, capacity and power, efficiency, battery life, and manufacturer. The best type of battery for your solar panel system will depend on what you’re looking for. There are three battery types that work exceptionally well; however, each battery type has pros and cons. So the first decision to make is the type of battery that will fit your system. Lead acid batteries are among the longest-used and most reliable batteries in existence. They are the cheapest option but you trade cost for battery life and depth of discharge. But for homeowners needing lots of storage for a lower cost, or if you are just making the move to a solar system, lead acid may be a very good option. Saltwater batteries are more expensive than lead acid batteries, but also have a greater lifespan. Unlike lead acid batteries, saltwater batteries are essentially brand new to the market and remain both somewhat untested and harder to come across. Of the three types of batteries, saltwater has the greatest depth of discharge, so you’ll get the most output per charge before needing to recharge. Lithium batteries are the most expensive and the longest lasting of the three types of solar batteries. Their depth of discharge is less than that of a saltwater battery, but more than that of a lead acid battery. Comparing all three options, the lithium battery is probably the highest rated, but also the least accessible cost-wise. Once you’ve picked the best battery type for your solar panel or off-grid system (that meets your system’s needs), there are components to explore to find the ideal battery for your system. Cost is probably one of the more obvious components. But the old saying, “you get what you pay for” holds true when buying batteries as well. In some instances though, certain batteries may be overkill for your system so the most expensive battery may not be the best choice always. For most systems, a battery will cycle daily, meaning it will charge and drain regularly. With each cycle, the battery’s ability to hold the same charge lessens slightly. So one component to consider is the warranty on the battery that guarantees a certain number of cycles of useful life. Depth of discharge is how much you can drain the battery down before needing to recharge the battery without harming its life. Certain solar batteries can be depleted further than others, allowing for more use between charging. Essentially, a battery with a 90% depth of discharge per cycle will provide more battery power per charge than a battery with less. Measured in kilowatt hours (kWh), capacity is the amount of energy a battery can store over time. More literally, capacity is how much energy (measured in kW) a battery can store over time. The more capacity a battery has, the more power it can store. Power is how much energy a battery can provide at a given moment. A battery with both a high capacity and high power can run a large system for several hours; a battery with low capacity and high power can run a large system but only for a short time. Efficiency is the amount of energy used compared to the amount of energy it took to store said energy. Batteries require power to charge and efficiency compares the energy taken to charge a battery with the amount of energy that the charged battery produces. The higher the efficiency, the more cost-effective the battery. This may not be a component most would consider, but it is something to pay attention to. As with other technology, there are both trusted brands and start-up brands. A trusted brand comes with known flaws and benefits; a start-up brand can perhaps have better technology, but can also have yet unknown technological issues. Depending on your system needs, you may decide to go with a well-reviewed company or one that is brand new to the market. Part 3) What happens when your solar batteries start to die? If you follow this article you should be able to compare batteries and pick out the best battery for your solar system’s needs. It’s vital knowing how to tell if a battery is dead or about to die because a lot of other issues would be avoideed if we have this knowledge handy. A car can’t simply function without a battery. It’s an embarassing thing and most inconvinient if your car suddenly stops in the middle of the road, with some passerby drivers looking at you glaringly and annoyingly as if something out of the ordinary just fell down from heaven. Trust me i have been there before and it wasn’t a good experience to recount. I felt like the ground would open up and hide me inside. Especially when i realised it was a situation that could have been avoided if only i took notice of my battery dying signals. The good thing is that there are numerous ways of knowing if your car battery is about to packup and should be replaced. In this write up we’ll learnhow to tell if a battery is dead or about to die and ways to recondition batteries. First and foremost let us understand that a battery’s condition is very crucial to the overall good functioning of a car and its durability. The essence of a good working car including its engine depends on a good battery. 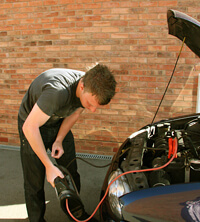 a non-maintained car battery often results in so many car problems that could have been avoided. Let’s examine these 7 signs, it’s also imperative to note that when having issues with your car battery, check to see that the battery connection and cables are properly in place because sometimes a larger problem could be as a result of a faulty connection. If your car takes a while to start when turning on the ignition or it turns over for longer than usual. This often means your battery is dead or going bad. A consistent reoccurence of this sign means its time to get a new battery or refurbish the old one. Learn how to never waste money on a new battery again and how to bring back a dead car batteryThis could come handy or be a life saver especially when the car stops in the middle of nowhere due to a suddenly dead battery. The age of your battery is another way of knowing how to tell if a battery is dead or about to die because the closer your battery gets to its full life span of 4 to 5 years the more you should be prepared to either replace it or recondition it to become new again, and ready for another five years life circle. How to give the battery a new life span. If the electrical gadgets of your car are finding it difficult to function well. A malfunctioning electrical gadget is how to tell if a battery is dead or about to die. Gadgets like the wipers, power locks, windows, windshield wipers, lights and so on. All of these are a way of showing that the battery is weak and needs a replacement or refurbishment. Smell is a strong indication of how to tell that a battery is dead or dyingThe smell of a burnt wire is often an indication of acid leaking batteries. This could be hazardous to other engine components if not rectified quickly. What you should do anytime you notice this sign, is to get a mechanic check your battery or use this quick and effective method to quickly get your battery fixedDo it yourself battery reconditioning steps. If needed to jump your car battery to get it started for like three two to times a week, then its about time to replace or recondition your battery. recondition it. Note that if you have to continue jumping your battery to get it started, it may eventually affect other parts of your car. To extend your car battery lifespan, a regular maintenance should not be overlooked. use this simple method to extend your car battery lifespan. Sign Up Today & Learn How To recondition any type of batteries,where to find dead batteries and how to sell reconditioned batteries..for FREE!